Thanks for sharing this, Rich. When I see a review like this, I wish reviews were not anonymous. I doubt anybody would write such pointless and arrogant text, if they knew that their name would be attached to it forever. Re: non-anonymous and open peer review, be careful what you wish for. They have their own serious problems, and it’s not clear that they even solve the problems they purportedly solve. Over a period of about 25 years my experience with reviewers has been mainly positive, maybe 80% of the time it’s been useful and led to improvements in the final paper or chapter. Just occasionally, however, reviewers get things spectacularly wrong, as in this case. Not just wrong, but self important and condescending too. Something similar happened to me a few years ago when I had to appeal a decision at Oikos, which had opted to reject a short paper because one of the reviewers dismissed it in a few lines as “of no interest”. That paper (“How many flowering plants are pollinated by animals?”) is now the most cited paper in Oikos in the period 2010 to date, by a factor of two. As both your story, Jeff, and Rich’s story suggest, often it is the more non-traditional, potentially truly novel papers, that get the harshest reviews. Good editors see through this. 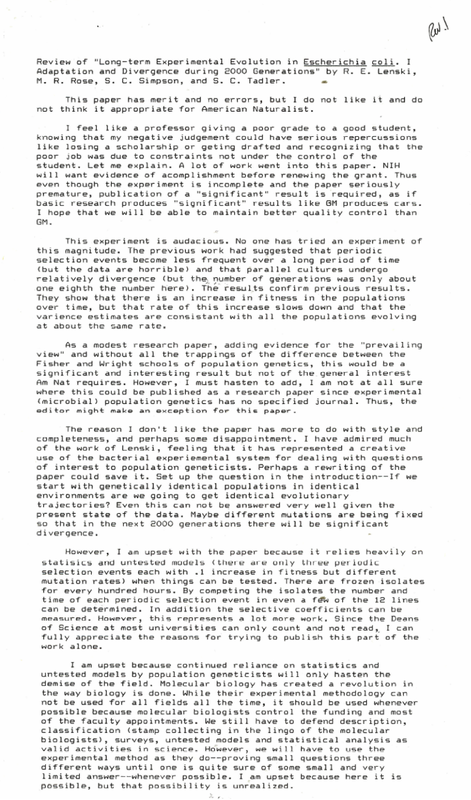 Hi Rich; In 1975 I submitted an Optimal foraging paper to ‘Theoretical Population Biology’, and Tom Schoener got 3 reviews: all 3 were quite negative and urged rejection! Schoener had me revise the paper, and then it was accepted. [ Schoener has published this story too]. Of course it was the ‘ marginal value theorem paper’ and went on to be the most cited paper ever published in TPB [ GS cits ~4000 ].